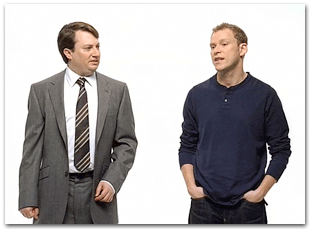 Does Bill Gates Always Say "No No No" When He Hears "OS X"? Still on the Vista media blitz, Bill Gates dropped by CNN, only to be asked the question of questions: "Were you going after a specific look there, the Mac look?" Haha. He must get that a lot. For über web surfers and curious web programmers. I love the ducky, but it is definitely slow, especially with multiple file uploads. Maybe it's time to try Yummy. Check out the different spin on familiars ads, plus two new ones. "The Palm OS is a weak No. 5 in the smartphone operating system market, accounting for less than 2% of worldwide sales in the third quarter last year.... Palm OS's momentum is heading the wrong way." ATTN Palm Users: Palm is not Apple. Thought this entry at Gizmodo was way too funny not to call out. "Washy washy, all my dirty laundry." "What you need to know about the wireless networking standard Apple supports"
If you're in the market for a new wireless router, don't miss this: Up close with AirPort Extreme. "What I had thought were signs of a broken educational system - the seemingly random placement of commas, the spastic syntax, the obnoxious overuse of quotation marks, the goofy misspelling of "Jouralism" - were actually signs of the New Instantaneousness." "Microsoft sent this tape to retailers to explain the benefits of Windows 386. Boring until the 7 minute mark when the production is taken over by crack-smoking monkeys." That's very good, Linda. That's very good.